After years of planning for the largest project of its kind, the Department of the Interior will begin removal of two dams on the Elwha River, Washington, in September 2011. For nearly 100 years, the Elwha and Glines Canyon Dams have disrupted natural processes, trapping sediment in the reservoirs and blocking fish migrations, which changed the ecology of the river downstream of the dams. All five Pacific salmon species and steelhead—historically present in large numbers—are locally extirpated or persist in critically low numbers. Upstream of the dams, more than 145 kilometers of pristine habitat, protected inside Olympic National Park, awaits the return of salmon populations. As the dams are removed during a 2–3 year project, some of the 19 million cubic meters of entrapped sediment will be carried downstream by the river in the largest controlled release of sediment into a river and marine waters in history. Understanding the changes to the river and coastal habitats, the fate of sediments, and the salmon recolonization of the Elwha River wilderness will provide useful information for society as future dam removals are considered. 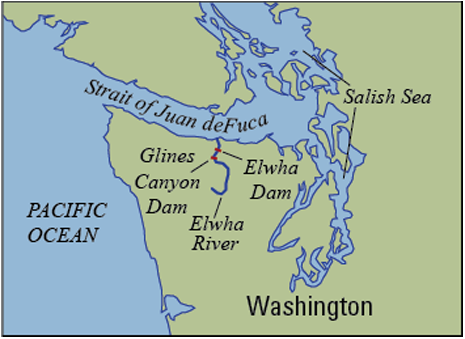 Location of the Elwha River in Washington. How will the rebuilding of salmon populations unfold, especially in terms of life history diversity and productivity? What will be the response of resident fish populations and other aquatic life to returning salmon populations? 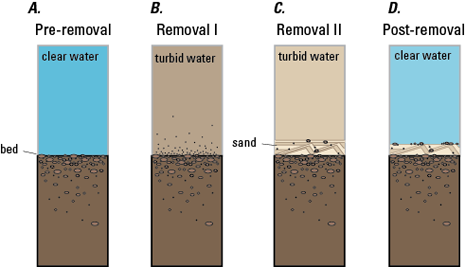 How and when will sediment redistribute through the system? How quickly will the ecosystem stabilize after full dam removal, especially the former reservoir areas? How will released sediment affect freshwater and marine ecosystems and their biota? How will other animals, such as ducks, river invertebrates, frogs, and black bears, respond to dam removal and the return of salmon to the upper parts of the watershed? How will plants recolonize and what influence will invasive species play in revegetating exposed reservoir areas? Glines Canyon Dam (left), Elwha Dam (right). The U.S. Geological Survey (USGS) is implementing many integrated research and monitoring activities in the Elwha River ecosystem. Studies are focusing on comparing physical and ecosystem processes before, during, and after dam removal. This work is important for developing baseline information to evaluate the effects of the dams, as well as to measure ecosystem responses following dam removal. With federal, state, academic, and tribal partners, the USGS is developing new ecological information about the Elwha River fish and wildlife populations, vegetation patterns and dynamics, sediment transport and storage in the reservoirs, river channel and coastal evolution downstream of the dam sites, hydrological processes, nearshore bathymetry, coastal habitats, and beach erosion. community is dominated by resident bull trout and trout. Coastal environments where rivers flow into the ocean are among the most biologically diverse and productive ecosystems in Puget Sound. Estuarine and coastal waters of the Elwha River serve as important nursery grounds for juvenile salmon and other commercially important species. Working with the Lower Elwha Klallam Tribe and other partners, the USGS’s MD-CHIPS project is studying the condition of the lower Elwha River ecosystem near the coast. Scientists use historical aerial photographs in concert with contemporary data collection and analyses to document changes to the Elwha River ecosystem downstream of Elwha Dam. Scientists also measure modern flood responses and rates of channel migration in the lower Elwha River, sample fish and invertebrates in the estuary, conduct scuba dive and sonar surveys, deploy instruments to measure salinity, temperature, and groundwater levels, and measure waves and currents in the nearshore zone. Highlights of these research efforts were published in Duda and others (2011). At least 16 fish species reside in the Elwha River, including steelhead, resident trout, charr, and 5 species of Pacific salmon. Salmon are limited to the lower 8 kilometers of the river downstream of the Elwha Dam, where degraded spawning habitat has contributed to population declines. Resident rainbow trout and bull trout, listed as threatened under the Endangered Species Act, occur throughout the watershed and dominate the fish assemblage between and upstream of the dams. Introduced species, such as brook trout, currently are limited to parts of the river between the dams. Researchers have been conducting studies to describe the distribution and abundance patterns of fish communities throughout the Elwha River; identify patterns of age, growth, and residence of juvenile salmon and trout; and document baseline conditions of fish habitat throughout the watershed. Additionally, studies of marine-derived nutrients from adult salmon returning to the Elwha River and the status of aquatic macroinvertebrate communities (which are reliable water-quality indicators and a food source for fish) have been conducted in anticipation of the dam removals. Future studies during and following dam removal are planned to monitor changes in the ecosystem, including the rebuilding of Elwha River salmon populations. Runoff and snowmelt from the Olympic Mountains drain into many creeks and rivers that combine to form the Elwha River. This river basin covers about 833 square kilometers and contributes more than 1.2 cubic kilometers per year of freshwater to the Strait of Juan de Fuca. Most flow from the Elwha River comes from large storms in November through February and from snowmelt and precipitation in May and June. 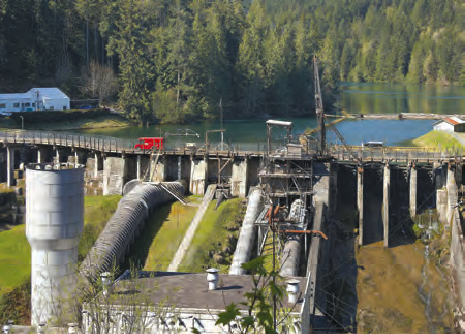 Because the Elwha River dams were used for power generation, their reservoirs were relatively full year round and did not decrease flooding in the river valley. In addition to forming the drainage network for the basin, stream and river channels are important flow pathways for sediment and organic materials from the mountains to the sea. Most of the sediment carried by the river is sand, silt, and clay, which is transported out to the coast during high flows. The river also carries larger gravel, cobble, woody debris, and even whole trees and boulders during storms. These materials usually are deposited in and along the river channel where they form important habitats for fish, aquatic invertebrates, and riparian vegetation. Long-term monitoring of discharge at gaging stations has been supplemented with focused studies of sediment transport, water quality, groundwater along the lower river, and the form and changes of the river channel. This legacy of baseline data and hydrologic research will be invaluable for interpretations of the river’s responses to dam removal. At the start of dam removal in 2011, approximately 19 million cubic meters of sediment was trapped behind the two Elwha River dams, enough to fill a football field to the height of 11 Empire State Buildings. During and following dam removal, some of this sediment will erode from the reservoirs and transport downstream. The rate of sediment transport will be determined by the magnitude, timing, and frequency of storm events, as well as the rate of dam removal. Sediment released from the two reservoirs will resupply coastal habitats throughout the Elwha River delta. Restored supplies of sediment following dam removal are expected to slow or reverse coastal erosion and modify coastal and marine habitats near the Elwha River mouth. A major focus of ongoing research is to understand the legacy of the dams on coastal processes and the restorative effects of dam removal on coastal features and habitats. Ongoing efforts include detailed surveys of the topography, life forms, and sediments in coastal landforms and habitats; measurements of coastal and oceanic processes such as estuarine mixing and coastal currents; and the development and testing of oceanographic numerical models. Collectively, these efforts are providing valuable information about sediment pathways, transport and deposition rates, and ecosystem implications of sediment transport. The integrated science approaches for studying the movement of sediment through the Elwha River coastal system is leading to the development of new tools for understanding how coastal ecosystems respond to large perturbations such as dam removal. 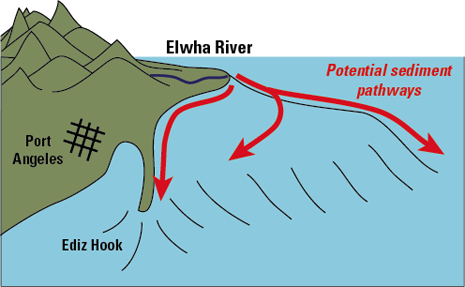 Hypothetical changes of the coastal water turbidity and seafloor sediment near the Elwha River mouth, during the dam removal process. During and following dam removal, additional sediment inputs to the areas downstream of the dams, as well as localized inputs of large woody debris, will lead to increased channel dynamics and vegetation change. Deposition of fine-grained sediment on flood plains could bury plants and influence the establishment of new vegetation depending on the sediment thickness and grain size of the deposits. Additionally, the sediment remaining in the former reservoirs represents a considerable challenge to revegetation goals in light of the extreme conditions expected for part of the growing season and the potential for invasive plants to establish and impede native plant communities. Researchers have established permanent transects and vegetation plots along the river to assess the distribution, diversity, and structure of vegetation communities growing in the river valley. These studies will be critical to assess vegetation changes associated with the dam removals. More than 100 species of wildlife are known to eat salmon during one or more stages of the salmon’s life cycle. 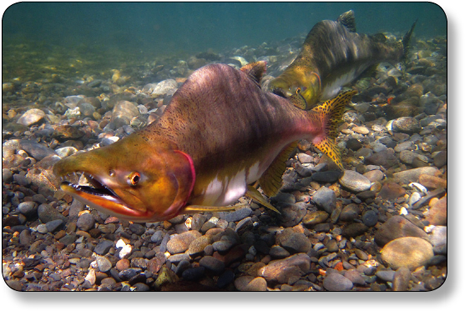 Additionally, nutrients delivered upriver by migrating salmon permeate wildlife food webs near salmon-bearing rivers. Despite a general appreciation that salmon are key to sustaining many species of wildlife in the riverine environment, few studies have described the effects of salmon on wildlife diversity, abundance, or distribution patterns largely because there have been so few opportunities for large-scale experimentation and long-term studies. The removal of the dams on the Elwha River offers an opportunity to investigate this aspect of salmon-wildlife interactions. 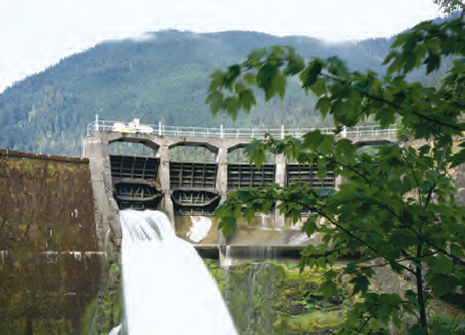 The USGS, National Park Service, and Lower Elwha Klallam Tribe have conducted many baseline studies of wildlife distribution and species diversity patterns to set the stage for assessing wildlife community changes associated with dam removal and salmon restoration. 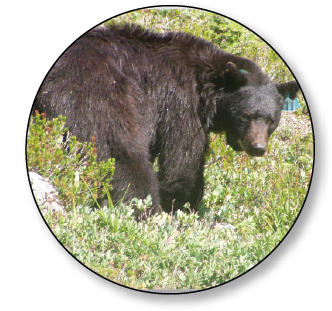 Scientists have used Global Positioning System radio-telemetry, molecular genetics, remotely triggered cameras, ‘sign’ and visual surveys, and small mammal trapping to determine pre-dam removal distribution patterns of black bears, small carnivores, amphibians, and small mammals. These studies are providing characterization of current wildlife communities and species distributions prior to dam removal, and the comparative baseline needed to evaluate long-term effects of watershed restoration on wildlife resources in the Elwha River ecosystem. Photograph of Glines Canyon Dam taken by Scott Church, private citizen. Photograph of two pink salmon taken by John McMillan, National Oceanic and Atmospheric Administration. U.S. Geological Survey scientists from five science centers work on the Elwha River. Fisheries and wildlife biologists, ecologists, hydrologists, botanists, marine geologists, oceanographers, and river geomorphologists are bringing their scientific expertise to the Elwha River to evaluate ecosystem status and change associated with the dam removal project. Duda, J.J., Warrick, J.A., and Magirl, C.S., eds., 2011, Coastal habitats of the Elwha River, Washington—Biological and physical patterns and processes prior to dam removal: U.S. Geological Survey Scientific Investigations Report 2011-5120, 264 p.
Duda, J.J., Warrick, J.A., and Magirl, C.S., 2011, Elwha River dam removal--Rebirth of a river: U.S. Geological Survey Fact Sheet 2011-3097, 4 p.